In bedrooms, headboards are a way to transform in minutes even the most ordinary bedroom and add comfort, appeal, extra color, pattern, and texture. Whatever their design and the material they are made from, headboards are a key décor element in terms of both functionality and aesthetics. With an array of options to choose from, it is not that difficult to find a solution, which fits in with the style of any bedroom. Usually, headboards make fascinating focal points. Furthermore, some truly unique ones offer an opportunity to personalize the space. 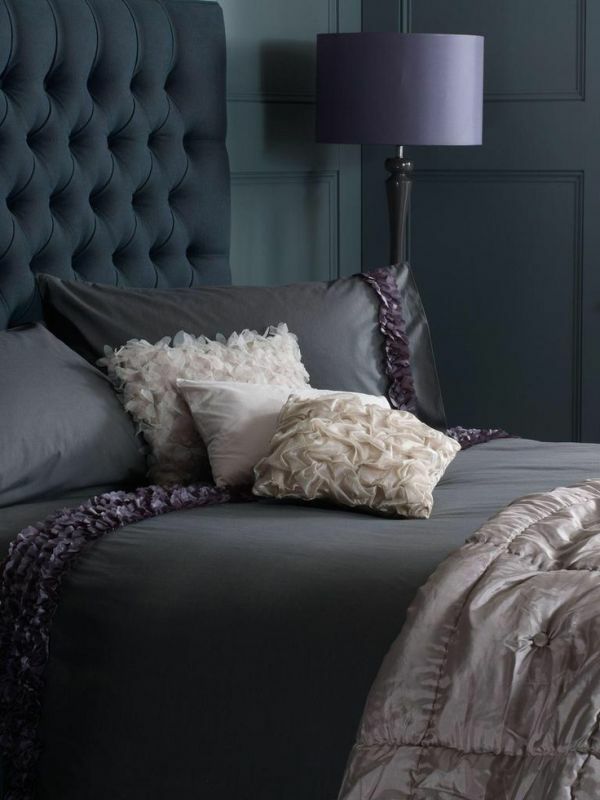 When it comes to velvet tufted headboards, they are an option to definitely add touches of elegance, luxury, and sophistication and take a bedroom to the next level. Whether wooden, leather, metallic, or fabric upholstered, of simple design or ornate ones, headboards are an easy way to dress up any bedroom and enhance its look. Note that an array of simple, easy-to-make DIY projects provide budget-friendly solutions to lend a new look to your bedroom. Actually, when speaking about DIY options, practically everything can become a headboard, from wood shims and wooden pallets or rope to salvage wood to repurposed doors and shutters for vintage touches to wallpaper and fabric to tapestries and quilts to tin tiles and salvage architectural details to upholstered panels to artwork and mirrors, just unleash your imagination and come up with a statement piece of décor. Plus, when creatively approached, headboards are always an option to add some extra bedroom storage. As more storage means less clutter, using headboards as storage is always an excellent design solution, especially in small bedrooms, where every inch counts. So, make the most of your headboard and add some extra storage. Closed compartments inside headboards or on their sides can be used for storing different items, from bedding to books to personal belongings. Furthermore, items, such as clocks and lamps can be positioned on top of the headboards. In addition, headboards offer space for displaying favorite mementos. In the picture above, a bedroom of minimal design with a distinctive organic vibe. A custom-made white headboard that offers side storage stands out against the neutral walls. Plus, a lovely display on its top is a small touch, which definitely makes a personal statement. Pops of blue add texture and visual interest. 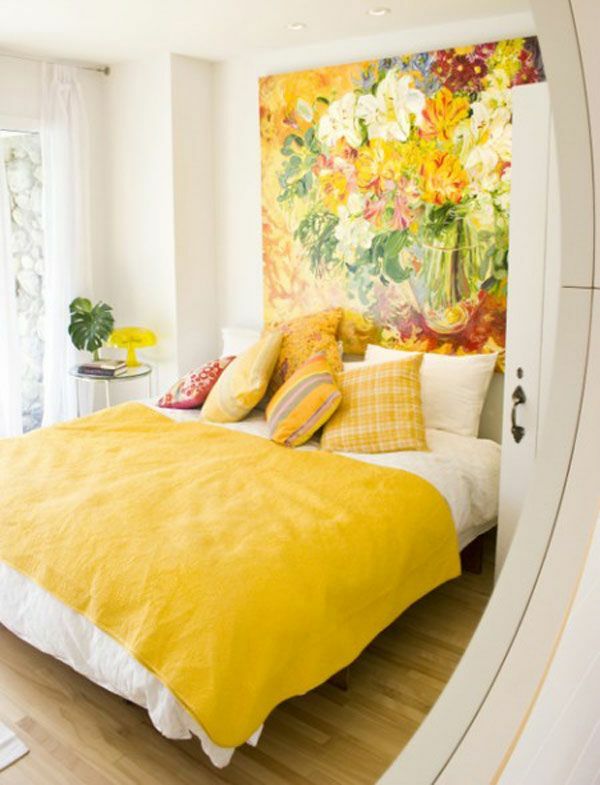 Flowers bring freshness and charm to this adorable bedroom. Wood never goes out of style. Furthermore, it is a classic décor option, which helps create a sense of warmth and coziness. It fits in with any design style, offers versatility, and adds organic touches. When speaking about wooden headboards, carved ones immediately come to mind. Carved headboards work perfectly well in traditional and Mediterranean-style bedrooms. Usually ornate, sometimes complementing a four-poster bed, they are true pieces of art, make fascinating focal points, add tons of personality, and lend the bedroom a unique, classy, unmistakable look. Above shown is a charming Shabby Chic bedroom. A stunning ornate whitewashed bed is complemented by a nightstand. 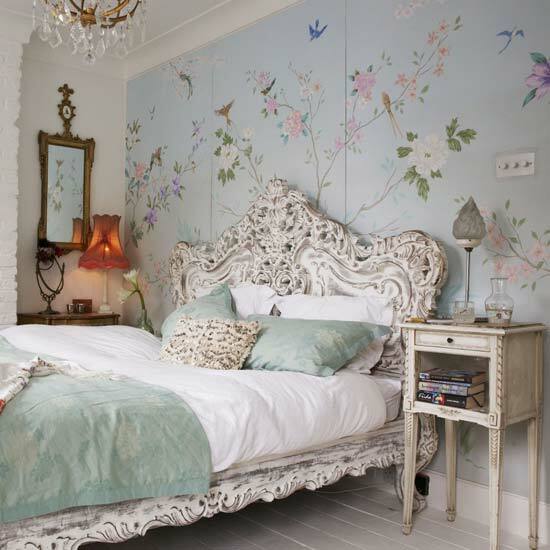 Soft, pastel colors and floral-inspired wallpaper just behind the bed give the space a delicate feminine look. Table lamps and a chandelier add visual interest. So charming and refined! Above, a bedroom with an exotic flair. 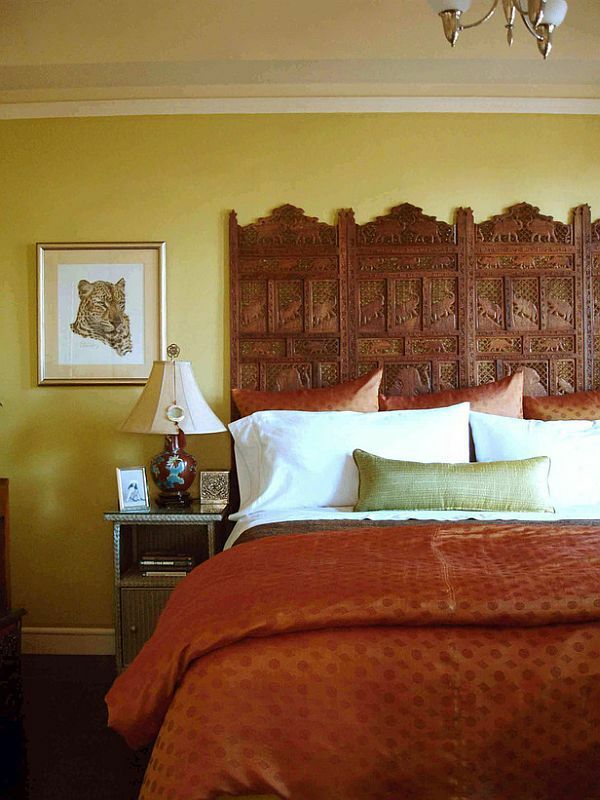 A magnificent four-panel hand carved screen serves as a headboard. What a way to add texture, visual interest, and personality! Truly an impressive space! Fabric and fabric-upholstered headboards, nailhead-trimmed or not, are a way to add comfort, texture, pattern, and color. When in vivid colors, such headboards definitely create make-a-statement décor elements and animate bedrooms. 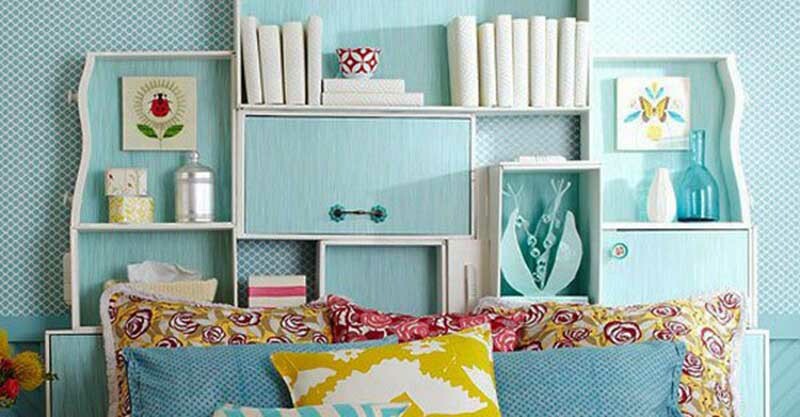 Furthermore, a range of DIY projects provide solutions for simple and budget-friendly options to renovate any bedroom. On a side note, when is up to the ceiling, any headboard adds height to the space. Unquestionably, tufted headboards, a variation of luxury fabric headboards, offer an opportunity to create refined, opulent bedrooms, add texture and softness, enhance the space, and take it to the next level. In the picture above, a moody bedroom with timeless charm. A tufted headboard complemented by luxury bedding lends the space a magnificent look. Beautifully embellished throw pillows add color, texture, visual interest, and gentle, feminine touches. An elegant table lamp adds to the appeal of the space. From designs with clean, geometric lines to refined to ornate to even ones made of corrugated metal, available in different finishes, metal headboards work well in both traditional- and contemporary-style bedrooms. Above shown is a magnificent bedroom. A bed with a classic handmade metal frame and headboard grabs and keeps the eye. Elegant pieces of furniture, wall sconces, and table lamps complement the wow-worthy bed design to make this bedroom the epitome of style, luxury, and sophistication. Above, a folding screen, a combo of intricately carved metal with a golden finish and mirrors repurposed as a headboard definitely makes a bold statement in this bedroom. An oversized floor mirror adds some extra visual interest. What a way to create a sense of drama, add artistic touches, and personalize a space! Actually, being a versatile décor item, folding screens are one of the most favorite budget-friendly alternatives to headboards. As they are usually decorated, screens can be instantly repurposed as headboards, which make a bold, dramatic statement. Screens come in an array of styles, sizes, and materials and finding one that fits in with your bedroom style is purely a matter of taste and creativity. In the picture above, a folding screen serving as a headboard adds some extra exotic touches to this mind-blowing eclectic bedroom. As already mentioned, the options for repurposing items into headboards are endless, anything from wall decals, wall signs, silhouettes, and posters to shutters to mirrors, frames, wood pieces, and shelves to artwork and wall arrangements can do the job. Although these solutions are usually simple, easy-to-make, and inexpensive, they add character, style, texture, and color, make instant focal points, and can lend a completely new look even to the most boring bedroom. 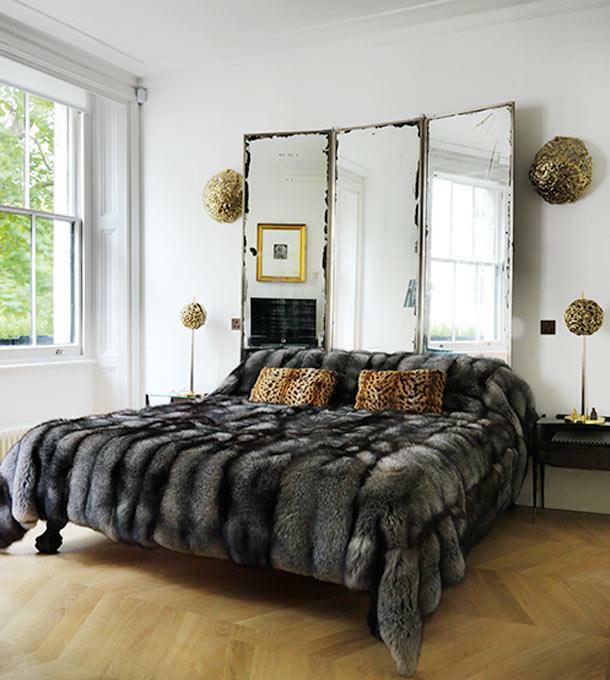 Mirrors are definitely a creative alternative to traditional headboards. Whether two-three large mirrors or an arrangement of smaller ones, they not only serve as a headboard but also create a sense of space. Above, a bedroom with a harmonious, balanced, textural look. 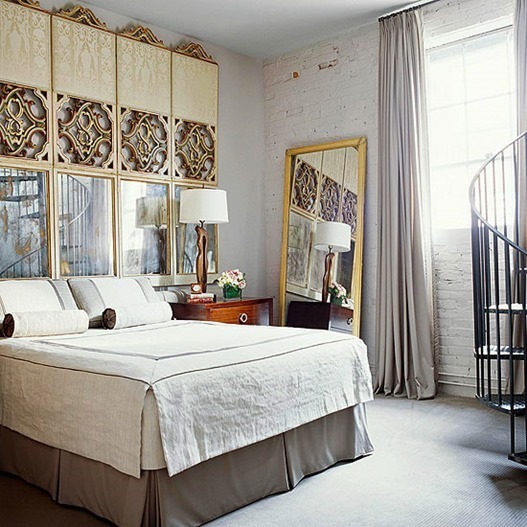 A set of three large mirrors serves as a headboard. As they add visual interest and artistic touches, pieces of art also make a spectacular alternative to classic headboards. In the picture above, a charming, inviting bedroom. Pops of yellow, which add pattern and texture, stand out against the background of the white walls. An oversized piece of art, which repeats the colors of the throw pillows, serves as a headboard and makes a stunning focal point. Yet not a must-have décor element, whether leather, wood, metal, or fabric ones, headboards are a way to add comfort and storage, embellish any bedroom, and lend it a complete look. Plus, a range of unexpected items – from curtains to pillows to salvage wood, also make fantastic headboards, which can personalize any bedroom. Not to mention that for extra doses of charm, lighting can be installed inside a headboard. So, unleash your creativity and come up with one-of-a-kind headboard that truly makes a fascinating personal statement! Please SHARE with the buttons below! Thanks!